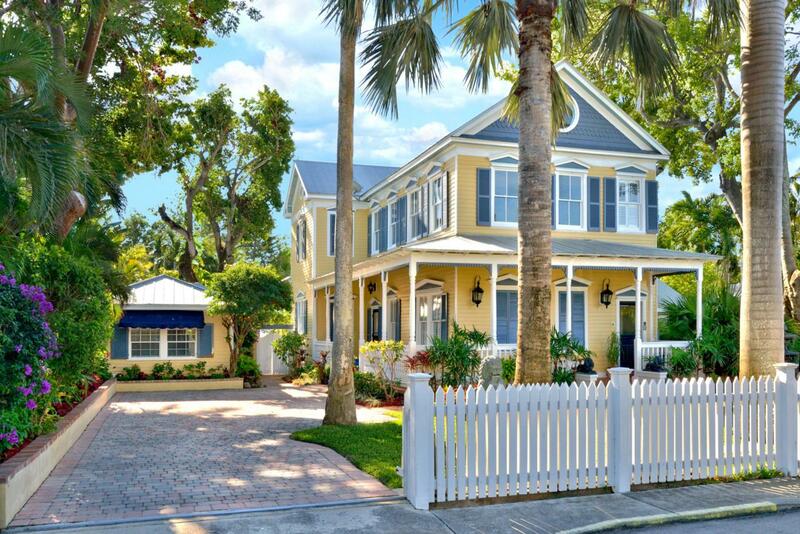 A grand dame of a mansion in Key West's premier, historic neighborhood, 1214 Olivia abides no comparison. She's an original, one of Key West's oldest, and her exquisite etched glass doors, magnificent Czech glass chandeliers, and 12'' wide heart of pine plank floors set her apart. She commemorates an era of hand-carved egg and dart crown molding, built-in library shelves crafted by a master woodworker, and furniture as sumptuous as ballroom attire. Every piece of this house feels soaked in story but standing solid to absorb more for centuries to come. Renovations have expanded the size, including a kitchen and living room facing a pool with a grotto waterfall, and a second-floor master bedroom suite complete with its own patio nook for morning coffee (or a nightcap) in privacy. Victoriansfrom the era of this house wouldn't recognize the 1,000-bottle wine cellar created from an old cistern; the cozy media room; the massive walk-in closet (complete with wardrobe sections, accessories drawers, and vanity); the security gate operated by remote control, or the outdoor gazebo with full kitchen and grill, but what has not budged with time is that this home only knows the scale of splendor. A few moments in the third floor, converted attic space, however, conveys the soothing effect of it as well, earned through longevity and care. Adjacent to the pool, a roomy guest cottage offers space for guests, an office or a studio, with a full granite counter top kitchen, rosewood floors, and Turkish tile embellishments in the bathroom. There were never many houses like this one, and today there are even fewer. It has lasted because it has passed through hands that care for it, and now it is ready for the next hands. Perhaps, they will be yours.